Although Jane's batting has not found its previous form at international level, her keeping record is second to none, with her 100th international dismissal the catching of Mason off Clare Taylor at Lord's in the 3rd One-Day International during the summer. This is a truly remarkable achievement putting her at the head of the all-time list of international wicket keepers. Most vivid among my memories was her 50 not out during that amazing match at Taunton, acquired off only 36 deliveries, striking 8 fours in an innings lasting just 46 minutes. She received an award for the fastest 50 during that game. Yorkshire's Salliann Briggs at the County Championships in 2002. ... and playing in the Super 4s in 2004. 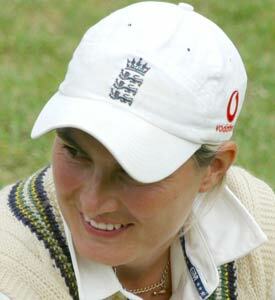 ... and catching out Belinda Clark off the bowling of Beth Morgan in the 4th ODI of the 2005 summer series.